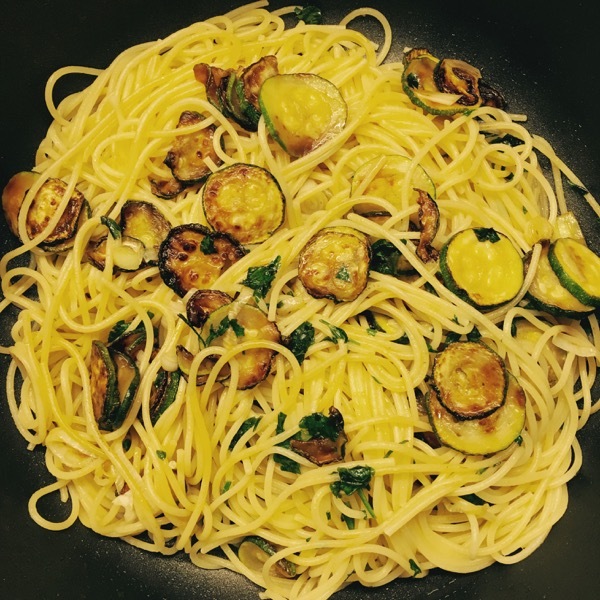 Posted on June 25, 2016 by Mara L.
Simple Pasta, By Mara L.
In between more ambitious cooking, I need something simple: spaghetti con zucchine. Following up on my credo that lemon is a great ingredient, here’s a way to make an inexpensive vegetable taste special. No offense, but zucchini can be a little bland. But they don’t cost a lot of money and are quick to cook, so I end up buying them anyway. To make them more attractive, I’m preparing zucchini by cutting up slices and searing them individually. This generates an unexpectedly intense taste. 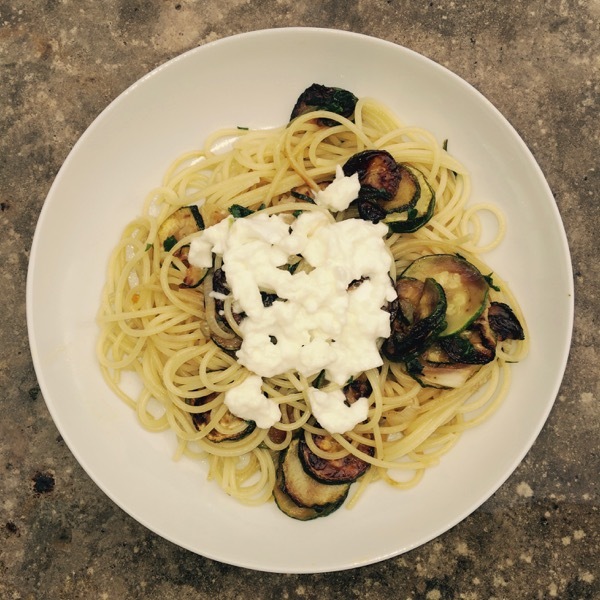 A moment of success: friends in Italy have asked me whether what they’re eating is really just plain zucchini! The slices that are done go on a plate, waiting until the rest of the dish has been prepared. I’m adding salt, pepper, and lemon (yes, again!) while they are sitting on the plate, already crisp and brown. 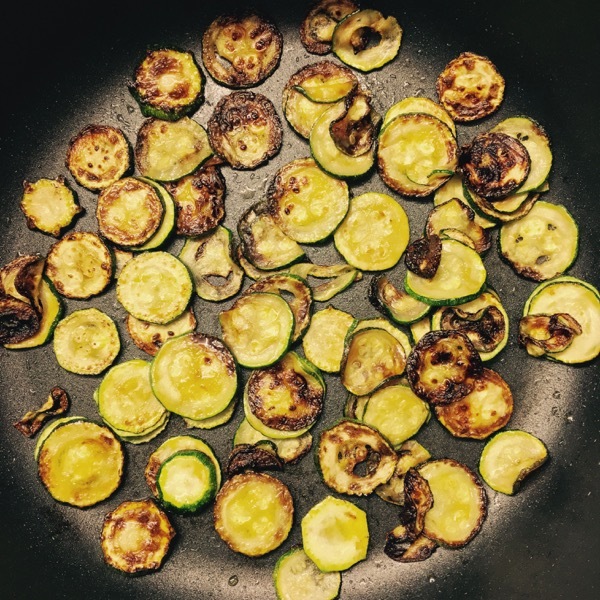 If you cut them very thin, they’ll turn into zucchini chips. But I don’t do that: too much oil, too little vegetable for my taste. Instead I’m cutting slices of 2-3 mm, so that below the crust there’s a recognizable bit of zucchini. And I wanted a Bavarian response to cooking with sage, a dish based on parsley. But here’s an Italian twist. 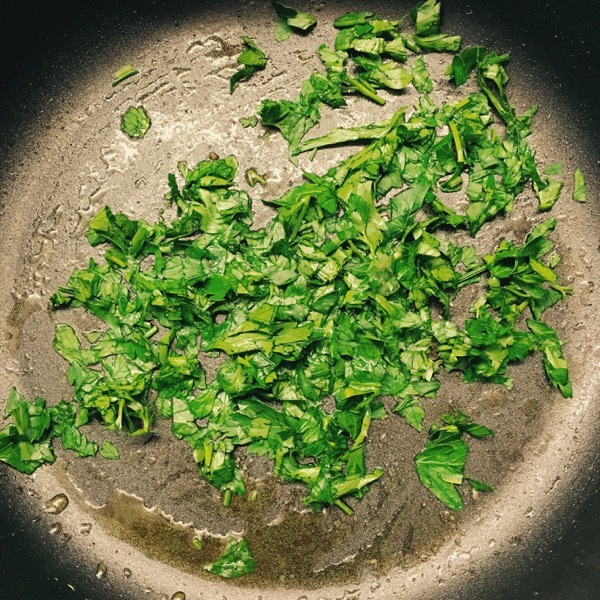 The parsley, a lot of it and finely chopped, is sautéed by itself in hot olive oil. The taste is rather elevated, as if it was truffle. Full disclosure: I came up with my way of searing zucchini in order to emulate this way of preparing parsley. I’ve heard Italian cooks call it prezzemolo truffelata. But I haven’t found this term online. Perhaps this is just too simple to make it into upscale Italian food blogs. Meanwhile, I cooked some spaghetti. They’ll get a tiny bit softer once you mix them up with the sauce. So I’m under-cooking them, keeping them a bit too al dente. And then I put everything together: pasta, zucchini, parsley, and more fresh pepper. Finally, it all goes onto a plate. I still had some of the nice organic mozzarella. This is something I learned in Maremma, one of my favorite regions in Italy. They use mozzarella for lots of purposes where people from Northern Italy use parmigiano, putting little bits on pasta dishes. I love it—it tastes like summer, cool and refreshing. Previous PostPrevious Scaloppine Di Vitello Alla Salvia, By Mara L.
Next PostNext Brezenknödel, By Mara L.